Fondant cakes, with their vibrant colors and sculptural designs, are striking when you see them in specialty bakeries and on TV shows like Cake Boss and Ace of Cakes. They look stunning, delicious, and admittedly, intimidating. If you’ve ever wanted to create a fondant masterpiece of your own, a trio of Detroit entrepreneurs has a kit to take you from start to (tasty) finish. The creators of the B+E cake kits are childhood friends Jessica Malouf, Stefan Ahee and Andre Ahee, who teamed together to launch Brys + Edgewood (named after the streets they lived on). When Jessica first tried making fondant cakes, they didn’t turn out with the professional look she wanted. After loads of experimentation in the kitchen, she and the Ahee brothers created a simple, affordable kit geared for amateur bakers. B+E kits come with Fondarific fondant, which is what gives each cake a colorful and smooth finish while keeping it moist and fresh underneath; disposable baking molds sized for the different designs; cake mix; decorations; buttercream icing; a cake tray; and instructions. If you’ve got eggs, oil, and water, you’re ready to bake. Be prepared to wow your family and friends. After a nationwide search for the best recipes, my partners and I combined a gourmet cake mix with a fondant that's not just for looks. We write and illustrate all the instructions to guarantee even the most amateur baker can create a confection that looks as good as it tastes. Any questions or comments? I’m here looking forward to talking cakes, fondant and everything in between. 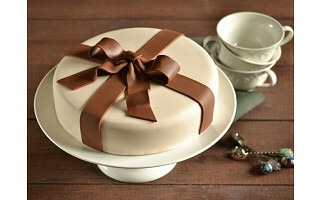 I was wondering if there were any other colors you can make the "present' cake, or if in the kit you have to do brown and cream? 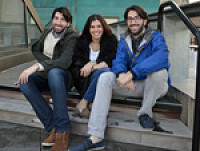 Jessica and co., so great to see three fellow Detroiters taking on this project! I grew up at Schoolcraft (now I-96) and Telegraph, on the west side. Where are your offices? Is your fondant a marshmallow type, classic, or something else? @ Dianne Sterling all of our fondant is buttercream flavor, with the exception of brown ,which is chocolate. 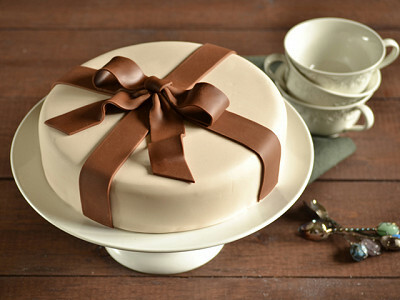 Unlike most fondant, our fondant is very easy to work with -- and you'll be surprised with how good it tastes! Great idea! I am wondering what the type of cake mix is in each package? @ Cindy Barlow Hi Cindy! All our cake kits come with the option of chocolate or yellow cake. When you're selecting the cake design, a cake flavor option should appear. Fondant cakes, with their vibrant colors and sculptural designs, are striking when you see them in specialty bakeries and on TV shows like Cake Boss and Ace of Cakes. They look stunning, delicious, and admittedly, intimidating. If you’ve ever wanted to create a fondant masterpiece of your own, a trio of Detroit entrepreneurs has a kit to take you from start to (tasty) finish. The creators of the B+E cake kits are childhood friends Jessica Malouf, Stefan Ahee and Andre Ahee, who teamed together to launch Brys + Edgewood (named after the streets they lived on). When Jessica first tried making fondant cakes, they didn’t turn out with the professional look she wanted. After loads of experimentation in the kitchen, she and the Ahee brothers created a simple, affordable kit geared for amateur bakers.